This is a demo video and demo blog. Video recorded, produced, uploaded from the Nokia N8. Embed code grabbed by ‘share’ing the embed code from the YouTube app. to the WordPress app on the Samsung Galaxy Tab. Photo sent from N8 to Tab via Bluetooth and then embedded in the post.It’s a simple, quick process. Total tIme to record, edit, upload and write post is under 10 minutes [correction. Its was closer to 15 minutes] which is fast for a single-man setup of 570gms and about €650. All-day battery life too! Let me know what you think about the quality of the video. Is it good enough for a first hands-on demo? I honestly don’t know why we like our family camping trips. Our garden is bigger than the average local camping pitch area, our car is so small that the rest of the family has to take the train and there’s usually a three week ‘window’ in which we feverishly check weather and try and juggle our work schedules to suit any sign of extended sun. Still, despite that, we seem to like it. We’re of for a three day local camp with our 10-yr old daughter and her friend and our little 16-month old son tomorrow and there’s just one thing bothering me. No, I’ve already got a process for keeping beer cool and I have no worries about being able to get a decent Schnitzel. It’s something else. I have no intentions of going ‘off the grid’ on this short holiday. While I don’t mind that as a test scenario, if i’m honest, there’s rarely a place I’m going where I haven’t got a few minutes to check mail, update statuses and do the ‘here’s my awesome holiday photo while you work’ thing. I want to stay online if possible. I’ve checked the provider coverage maps and even have a few different SIM cards with me but you never know. 64Kbps can cut-in at any time and you don’t want that to happen when you’re in the middle of a good Google Plus thread. There’s no way of knowing until I get there. As I was researching new ways to manage documents on my Galaxy Tab yesterday I stumbled across a Google Docs application which I hadn’t seen before. It turns out it was released yesterday! As someone who uses Google applications heavily, both on the desktop and on my mobile devices, I was of course interested to see how far it extends into the realms of true productivity. It turns out that it is no match for the real deal in a real browser with a real mouse and keyboard but it does offer a couple of very useful features. The Google Docs application shouldn’t be considered anything more than a text and number editing application. The lack of ability to edit spreadsheet equations or presentation documents had me reaching for Thinkfree this morning when I attempted to update my family cashflow spreadsheet on the Galaxy Tab. What it does do is provide an efficient way to access documents in Google Docs (when you have an internet connection) and to create a new document or upload documents from your device via the Android sharing subsystem. You can print via Google Cloud Print too which is a nice feature although it’s annoying that you can’t download a copy of a document through the application. Sharing and renaming is possible but it’s not possible to delete files. 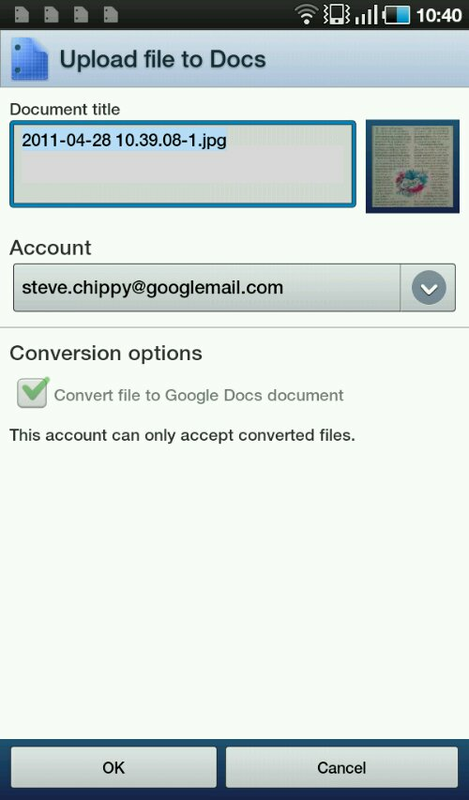 The application supports multiple Google accounts. Pinch to zoom worked smoothly on the Galaxy Tab and I was able to input notes easily. What a shame you can’t publish to a blog from the application. Some tie-in with Blogger would have been useful for some. I tried uploading an mp3 file but it wasn’t permitted. PDF files work and I was able to upload an 8MB file so file sizes are generous. Displaying that 8MB PDF was a basic experience. With no ‘go-to’ page feature and a slow page change time its impossible to view sections of a large PDF. Finally, there’s a potentially useful OCR feature in the ability to take a picture of a document and upload it for word recognition. Uploading a jpg file from the gallery resulted in automatic conversion to a document. There appears to be a setting that allows this conversion process to be turned off but on my Google account this option was greyed out. This feature can be useful for preparing an image for OCR before sending by using cropping and contrast settings. A magazine article I took an image of was not recognised properly due to it having two columns. By cropping the article around the columns I was able to get a readable version of the image in seconds after the file was uploaded. Good light levels and a steady hand will help! In effect, Google Docs for Android is a one-way file upload, edit and viewing channel that requires an internet connection at all times. That’s not too flexible in my opinion, but better than nothing. The OCR function is going to be very useful to some people. Trying to edit a document on a touchscreen highlights a major shortfall with tablets – roll-over detection. On Windows, there’s the concept of hover. Its either implemented through the mouse stopping over an element or via a digistiser that detects a pen physically hovering above, but not touching, an element. It’s something we’re all so used to seeing and using to activate help text or menus that when it is not there, it becomes a real issue. Designing applications that don’t use mouse-over is one way round the problem but when you consider right-click, lassooing sections of text, drag and drop and other features that are used in document creation, it becomes difficult to see how any tablet without hover or mouse-over detection could become truly productive, especially when you consider the amount of online, web-based applications that use mouse-over to trigger menus. That includes Googles own online applications. 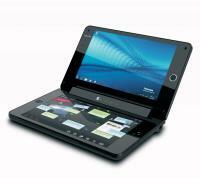 One of the most efficient handheld tablets I ever had for creation was the Wibrain b1. I still have it. Not only does it run a full OS with a full browser, it has a huge mouse pad under one thumb and mouse buttons under the other. It also implements a split physical keyboard. It’s close to being the ugliest mobile device ever but it works like a charm. My point is that if tablets want to be serious all-round become productive devices they need to consider more input methods. In fact, they need to become clamshells or sliders again. It is possible to make a 5 or 7″ slider with a keyboard, mouse control and full operating system but fashion and price is getting in the way. Just give me a little optical mouse with virtual mouse buttons. That would be a good start. For the time being, document editing, true document editing including spreadsheets and presentations, on-the-go is really only something you can do efficiently with a UMPC. Windows, mouse, keyboard. Tablets just don’t cut it, unless all you’re doing is entering alphanumerics. 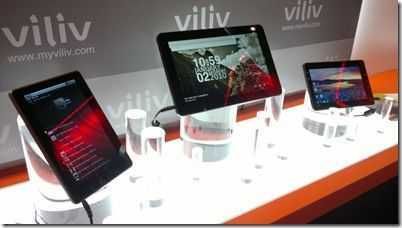 . .
How Was my CES 2011 Mobile Reporting Kit? My reporting kit changed quite a bit for this years CES show in Las Vegas. I’m aiming for a shift in devices, an improvement in video, preservation of my smartphone battery life and, of course, a test of new equipment. Without testing new equipment it is impossible to know if there’s a better solution out there. As a reminder â€“ here’s what I’m trying to achieve. You might ask why I still use the Touchnote and S2IS. It’s because the two are perfectly matched for the work I do. MJPEG videos at VGA resolution are crisp, the zoom and optics are great and the videos are super easy and quick to edit on a netbook. The Canon remote capture software also allows me to link the two devices for some really quick live blogging via USB. See the image below. I’m having real trouble finding a device, OS and camera combination that can beat it. My major issue though is low-light performance. It’s more than a few generations old and that means it’s a a number of F-Stops less sensitive than the latest compact cameras out there. In comparison with DSLRs it’s pathetic. Show me a camera with 10x zoom, good sensitivity, remote capture, 720p video, hinged viewfinder and I’ll consider upgrading both the camera and the netbook to support 720p H.264 videos too. If you can find one with Bluetooth too, I’ll be even more happy. Apart from the (not insignificant) issue of low-light sensitivity, the netbook/S2IS works well. I accept now that 500gm is the weight you have to consider for good battery life, connectivity, rotating screen and a long lens on a camera and that its unlikely to ever be possible on a smartphone. If this was a DSLR, it would be 1KG and $1K so using a bridge camera seems like an acceptable trade-off. I also accept that I need a full keyboard, Windows operating system and 5hrs battery life on a notebook in around 1-1.2KG. I don’t need graphics power, just CPU power. Dual-core Atom at 1.66Ghz with fast SSD could be the answer. The Lenovo Ideapad S100 is high on my list for 2011. Will I finally switch to Windows 7 in 2011? Old processes don’t die easily but if I can find a camera to match, i’m all-in. Aside from the ‘bum-on-seat’ scenarios talked about above I wanted to test a mobile blogging method that Jenn of Pocketables has successfully used in the past and one that i’m fond of perfecting in these quick-fire exhibitions. The process is more photo-blogging and micro-blogging than anything else but it can be quite effective in getting news out quickly and giving readers a sense of being there. The idea was that the N8 and the Galaxy Tab would work in harmony for this by sending images over to the WordPress application on the Tab, thumbing a paragraph or two and then posting to my website. The reality was slightly different. At 0900 on the 6th of January I lost any semblance of 3G connectivity from the Sprint MiFi unit I was using and due to the spotty and location-specific Wifi, the process crashed. A list of 18 hotspots on my Galaxy Tab is proof that I tried hard to stay connected. Despite the 3G problem, I think I’ve found a really great combo of devices in the Tab and N8 and I want to persevere. I did take a lot of photos with the N8 (about 300, mainly taken in low-light scenarios, parties etc) The N8 does a reasonable job of 720p recording too but there’s a showstopper for me there â€“ fixed focus. The N8 can’t be used to do close-ups. I hear that a firmware upgrade will introduce continuous auto-focus like it does on the Xperia X10 but until then, it’s no good as a video camera for me. Battery life on both the Tab and the N8 was more than 24hrs in this ‘shared’ scenario. I absolutely love the build quality on the N8 too. Add in the USB-OTG support, HDMI out (i used it in the hotel on a 42 inch screen), the FM radio and a few other nice features and you’ve got something that matches-up with the Tab really nicely. Of course, without the Tab I’m missing some Android apps and browser speed but to be honest, it’s not often that I’m without the Tab! As for the Tab, I used it a lot for calendar, Twitter, note-taking, maps, RSS reading, Google chat, Google latitude, ebooks, gallery and a/v entertainment. It was with me most of the time and proved its worth. It also meant that there were occasions, especially in the evening when meeting with other bloggers for chats and drinks, when I didn’t need to take the netbook. The next step is to ask Nokia if I can continue to test the N8, wait for the promised software update and take the same kit to mobile world congress where I expect to have a much better 3G service. I’ll re-try that micro-blogging scenario then. Between now and then though, I wonder if I can find a solution for the camera. Your feedback is more than welcome! If you have any questions about my set-up, feel free to ask below. Previous reporting kit reports, all the way back to 2006, are available here. Over at Carrypad I’ve been writing about another attempt to get a mobile reporting kit together. This time the Netbook gets left in the hotel and I try to use the Samsung Galaxy Tab as the main input device. I’m using it now and it is working out really well. The Nokia N8 works fantastically as a mobile camera too. Results in some low light tests I did snow a huge improvement in quality over my bridge camera, the Canon S2IS. Only the optical zoom is missing. One major problem I have though is video. With my bridge camera I can produce reasonably good quality videos at VGA resolution. The files are big mjpeg jobs but they’re easy to work with on a Netbook. 720p videos produced with the N8 however aren’t nearly as good. The stabilization isn’t as good, audio isn’t as good, there’s no zoom and the videos are done in fixed-focus mode. Given that the N8 is one of the best 720p capable camaeraphones out there, it looks like I will have to stick with my Canon S2IS. At 500gm it’s not much fun to carry around but what’s the choice? I love the zoom, the USB remote capture, the hinged viewfinder, the stereo mics and the AA batteries. The only device I can find that competes is the SX20IS but then we’re into H.264 territory which means the netbook would need to be upgraded in order to process the files. It’s still over 500gm too. Most people with any sense would just upgrade and take the hit on the extra weight but I am determined to focus on mobility here. Given the N8 can’t do the video, I need to focus on something else as the camera and video camera and just use the N8 for those times (many) when I haven’t got my camera with me. I’m currently looking at the Panasonic Lumix DMC-TZ10 which seems to be getting good reviews in the camera and video department. The Sony HX5 is also getting good video and low-light reviews. I have a week before CES so if anyone has any ideas, please let me know. One of them costs â‚¬299, one of them costs â‚¬360 and the other, â‚¬999. All of them weigh between 867gm and 1060gm. One runs on ARM/Android, one runs on Windows/Intel Atom and the other runs OSX/Intel Core 2 Duo. All are ‘instant’ on. At the MeeGo conference last week I had the chance to check out the Apple Mac Book Air. I had the lightest Intel Netbook (Samsung N350) and lightest ‘smart’ book (Toshiba AC100) with me at the time. I knew the Apple Mac Book Air (11.6 inch) was small but I was quite shocked to feel exactly how light it was. Ultra Mobile for me starts at about 1KG and the MBA fits in nicely. Battery life for me starts at 4hrs and the MBA fits in nicely again. Computing power for me must include a full web browser, a desktop OS and some video editing capability. The MBA fits in nicely, again, again! Long-gone are the days where netbooks were available at the 1KG mark. The Asus 901, Acer A150. 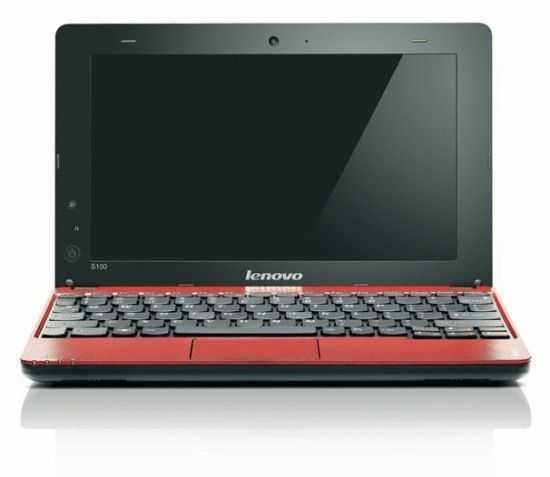 Classic 1KG, 8.9 inch netbooks that worked well as mobile-focused PCs for getting things done almost anywhere. The EeePC 901GO was arguably one of the best mobile bargains around at the time, at least in Europe. 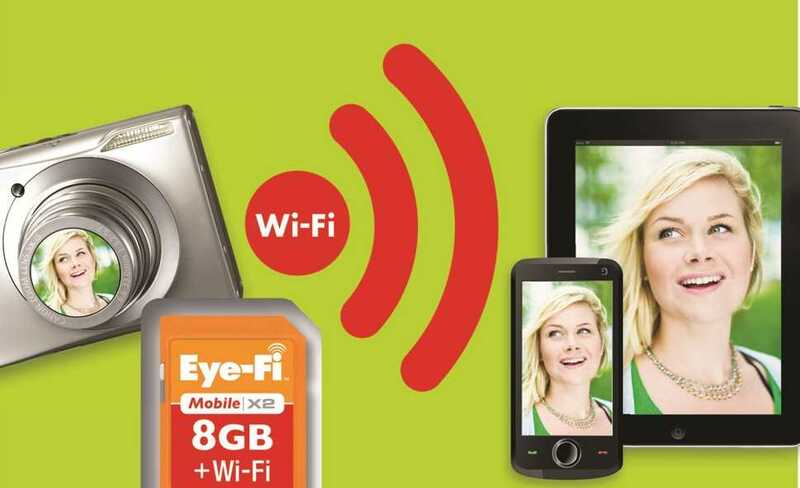 No hard drive, sub 1KG, 3G and a great price. Oh how things have changed. All we seem to see now are 10-12 inch devices at 1.2KG or more with moving hard drives. The 800gm-1KG mark is now a specialist segment. If you take a long hard look though and are prepared to relax your requirements a little there are a few gems hidden in there that would work well for ultra-mobile fans so I’ve taken a long look at the netbook segment, spoken to a few people (thanks Avram and Sascha) and come up with a shortlist for you. I’ve also taken a look above and below the netbook segment to give you a few alternative options. 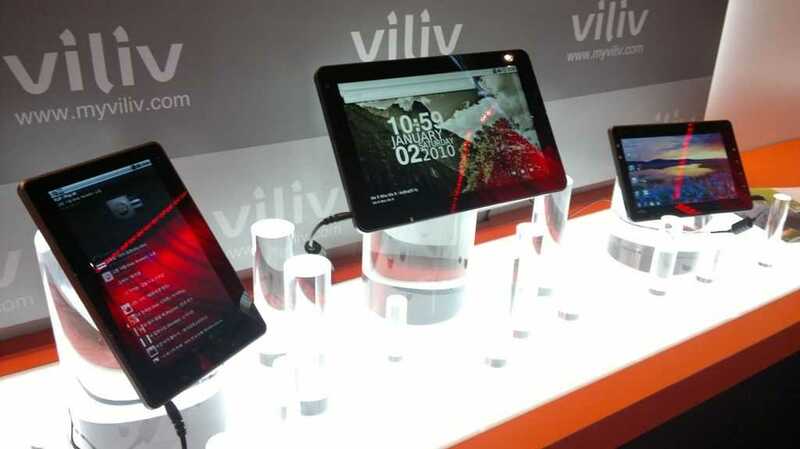 Ultra Mobile devices need to be feature-rich, rugged and connected. They are the Swiss army knives of PCs that need to be ready for anything. Getting the best productivity out of any situation is important. 12 inch devices give great comfortable real-estate. 10 inch devices can be good value. 7 inch devices get right under the 1KG mark. Here are some other important features. No Hard Drive. Ideally you don’t want any moving parts at all in a mobile PC. Hard drives and fans can fail or get damaged and even rotating screen hinges need to be thought about very carefully. If an SSD doesn’t come as standard, I’ve looked at the upgrade possibilities. Bright screen. Matt finish. 10 â€“ 12 inch for comfortable productivity. 7-10 inch for lighter weight. I took the train down to Munich today to meet up, or rather, Tweet-up, with Intel. It was a great evening and there’s more to that part of the story but it’s the City Night Line night-train back that I want to tell you about now. 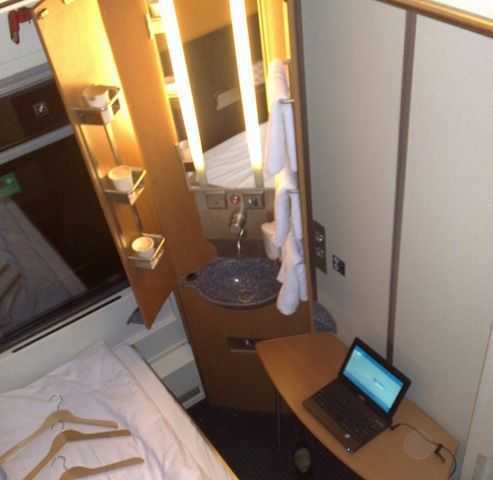 I’m on it as I write and I have 6 hours until I arrive at Bonn so let me tell you a little bit about a single cabin on the night train from Munich. Ultra mobile fans will be just as excited as me! Update Feb 2019. 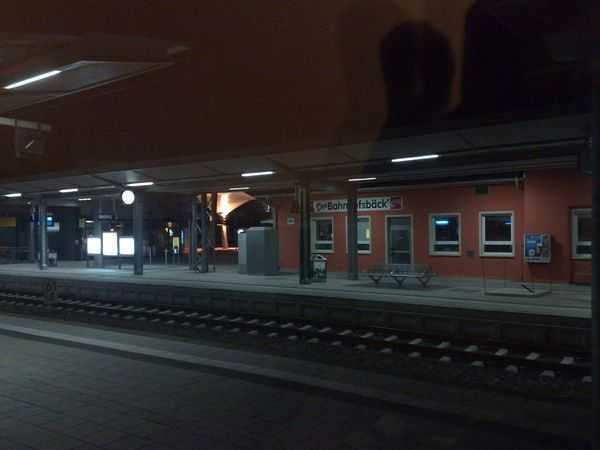 The Deutsche Bahn has removed the City Night Line from service due to profitability issues. 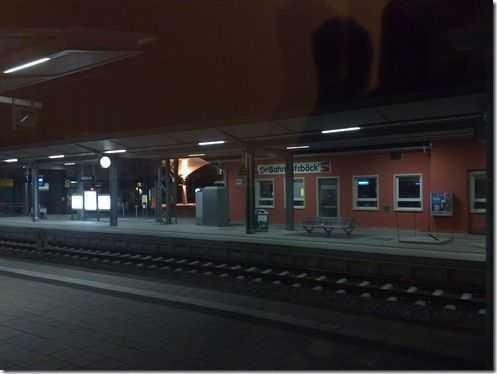 Three are still some Europe-wide night trains that pass through Germany but these classic and wonderful night trains are no more. A planned Luna-Liner network across Europe is still not in service. The Boy Scout in me did it. Rather than book a hotel I wanted to test the night train so I booked a single sleeping cabin for about 120 Euros (normally about 150 Euros but I have a 25% discount card) on the 22:43 from Munich to Amsterdam. I didn’t know what to expect although I had high hopes. 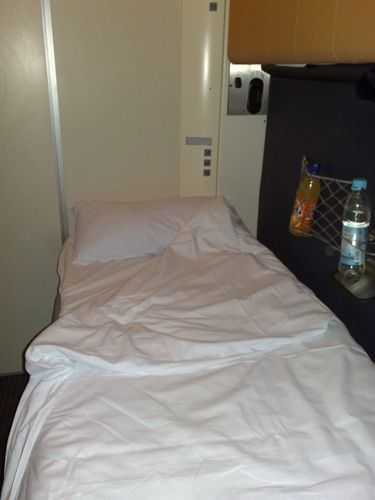 German high-speed and long distance trains by Deutsche Bahn are normally excellent and I’ve had nothing but good experiences with them so although I knew I wouldn’t get the Orient Express, I was expecting some good German engineering and possibly, some sleep. I feel like a kid. Really. I’ve been telling everyone about my ‘nachtzug’ and looking forward to checking it out but the wind got taken out of my sails at the meeting this evening where I heard nothing but nightmares. ‘Murder on the DB Express’ said one. ‘You’ll feel like you’ve been beaten up’ said another. Oh boy. Tada! Viola! Uberaschung! What a pleasant surprise. 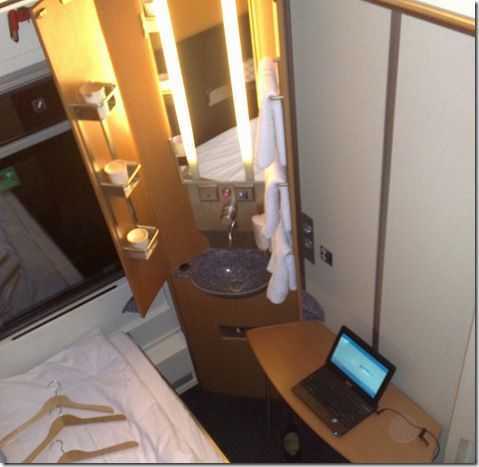 he City Night Line sleep cabin in single-person configuration. This is turning out to be quite the fun experience. 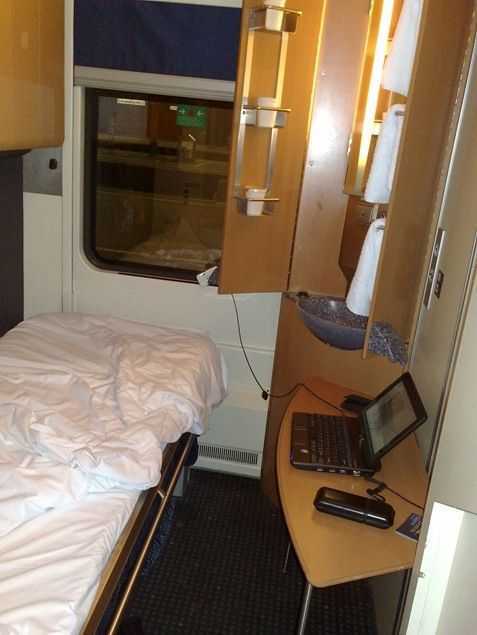 Here I am sitting on the side of my bed with a Mifi hotpost serving internet, a friendly conductor, a wake-up call and take-away breakfast planned for 0500 (20 minutes before we arrive,) power, a relatively smooth ride (I’m a baby, I love sleeping in moving vehicles) and a cold German beer. I’ve been shown around my room, given a demo of the multi-option lighting, checked out the built-in wash basin and even have a card-key to lock my door when I go to the toilet or shower. Yes, on-board (although shared) shower! I’m so excited that I’m not sure that I need to sleep tonight. So let me show you round the cabin. From above. This isn’t exactly a huge room but I feel sure I’ve had smaller ones in hotels in Holland. I can nearly touch both walls, lengthways, at the same time and we’re only talking about a width of about 200cm. There’s no en-suite toilet and the walls are thin. Ear plugs recommended! This is an extremely small room. 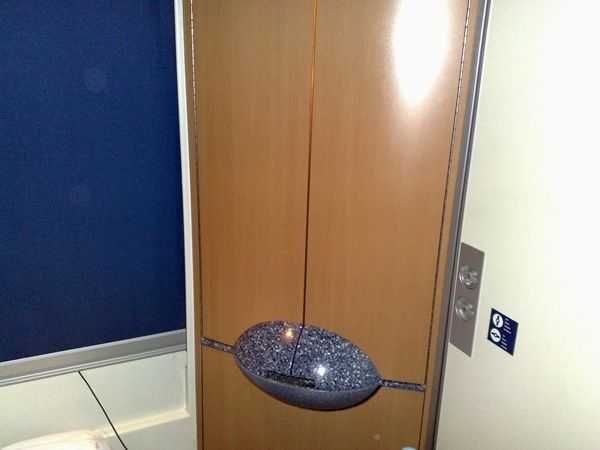 The room has controllable air-conditioning and has a range of lighting options from blue night-light to reading light, spot-lights and a full-flood light. There’s a stow-able table that extends right out to the bed where I’m sitting and working right now. 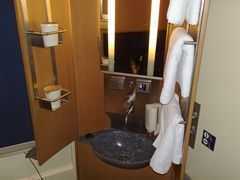 The corner area houses a basin with soap, warm water, fresh towels, a shaver power socket and a lighted mirror. Everything is clean, everything works, nothing is broken (as far as I know) and everything is solidly built. There’s hardly a squeak or rattle to be heard. German engineering folks! 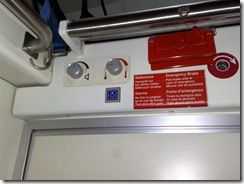 Air-conditioning, volume (for announcements) and the emergency brake. 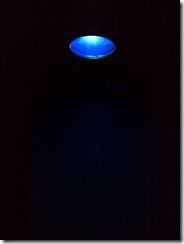 Blue night-light too! In one corner of the room, you’ve got the wash area. Set-up for three people it looks good although I recon there’s some room for more engineering here. How about a little shelf? 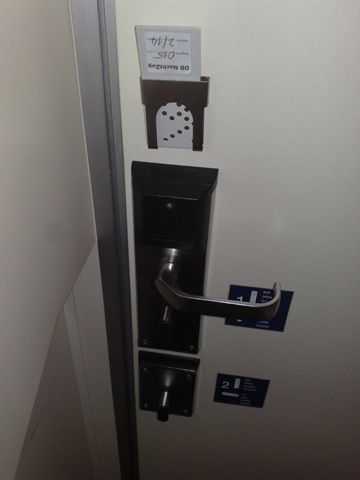 Double-lock doors and a card-key give at least a feeling of security. Bear in mind that anyone can walk through this section of the train. Power! The most important consideration for a travelling blogger. 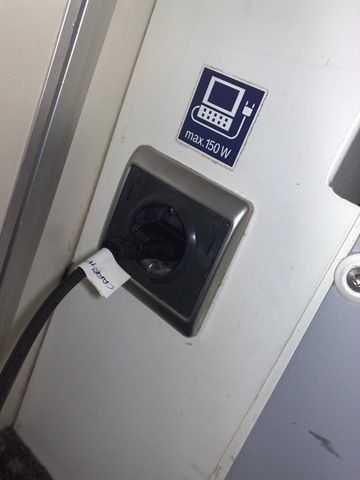 150W is enough for most laptops but the conductor claims that my laptop (a netbook) is the first one that’s worked on the supply. Apparently most people use the shaving socket! And finally, the bed. Solid, about 200cm long and with clean sheets, it’s something I’m going to enjoy very much after I’ve posted this. Blogging while mobile just took on a new meaning. Goodnight everyone. P.S. Obviously my hotspot is working too!